If you are not familiar with plantain bread (plantain cake), you are in for a treat. This bread is gluten-free, delicious, and is a perfect alternative to banana bread and a great way to use your ripe plantains. In Haiti, we eat a lot of plantains. Caribbeans in general, eat a lot of plantains. This is to include boil, fried, or baked. So it’s no secret we would also found a way to turn plantains into desserts as well or serve it as bread. This bread is by far my favorite to make! 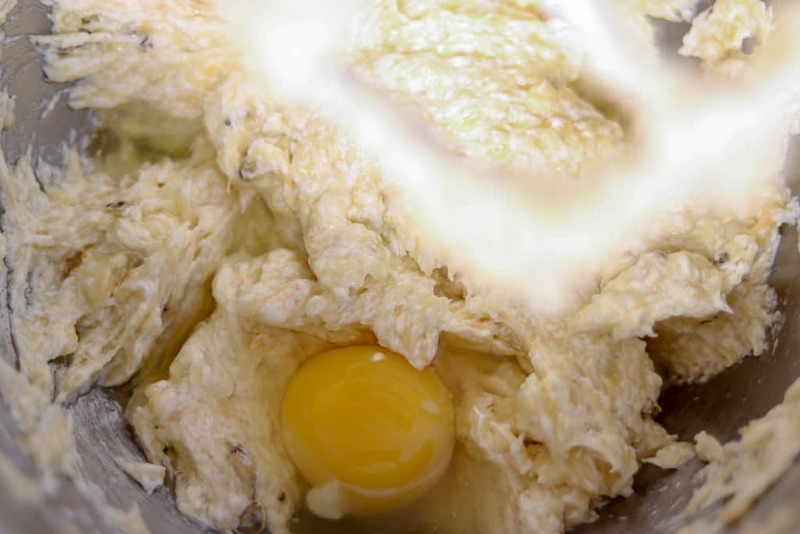 If you are familiar with banana bread, it is pretty much the same method. The key is to make sure the plantain is ripe enough or soft enough. Once it starts turning yellow with brown or black spots, just like a banana, then it’s time to turn it into a dessert. This bread/cake can be served for breakfast, lunch, or dinner. It’s the BEST! How to make plantain bread (Plantain Cake)? Very easy! You will need the following ingredients. Plantain, gluten-free flour or pancake mix, sugar, butter, baking powder, sour cream, eggs, vanilla extract. See step-by-step picture in the recipe notes below. 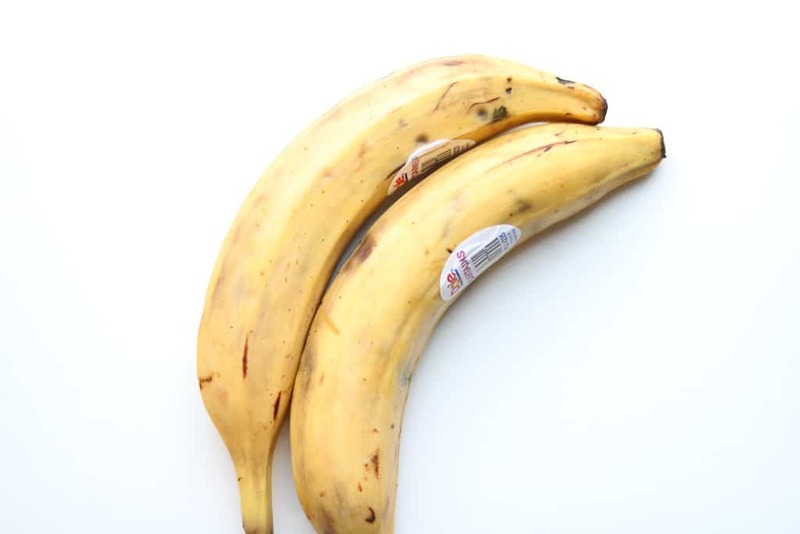 Can plantains be substituted for bananas and Can plantains be too ripe? 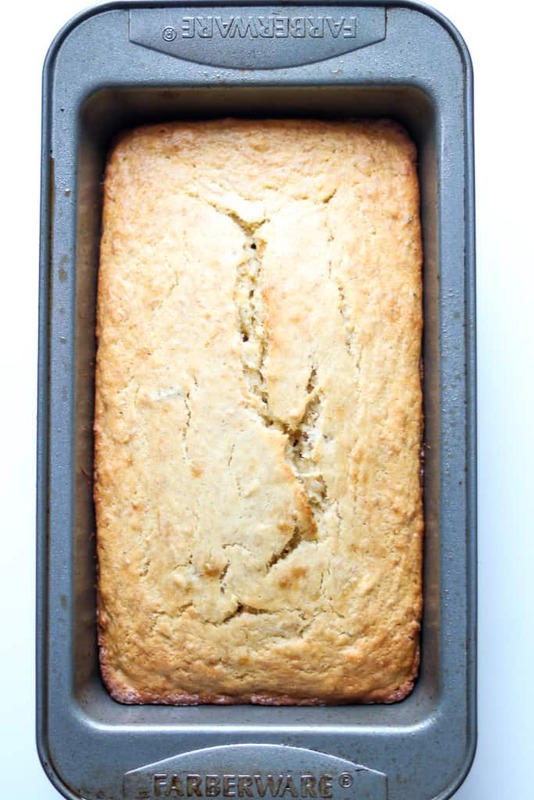 Yes, you can use bananas in place of plantains and follow the same steps to make this bread. The riper the plantains, the sweeter it will be. In the end, it will taste as if you were eating banana bread. If you love this plantain bread recipe, you’ll love these Macaroons! 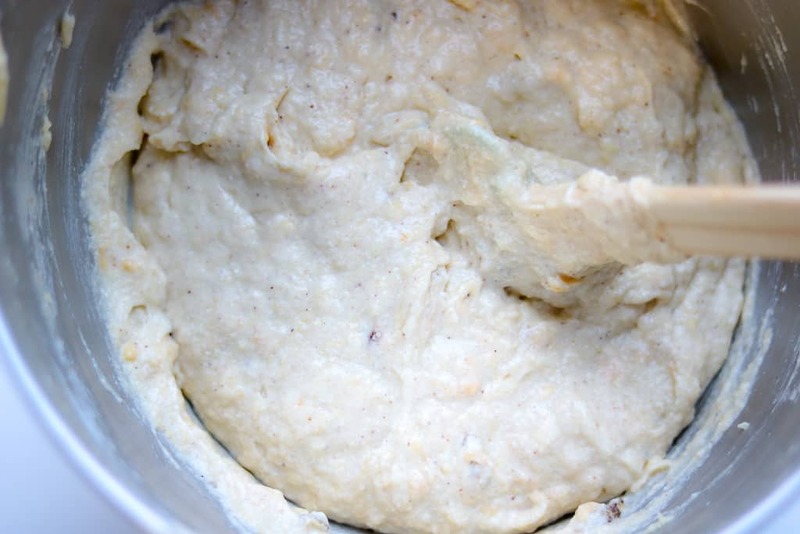 Did you make this Plantain Bread recipe? Tag me on Instagram or Facebook and please give it a star rating below! 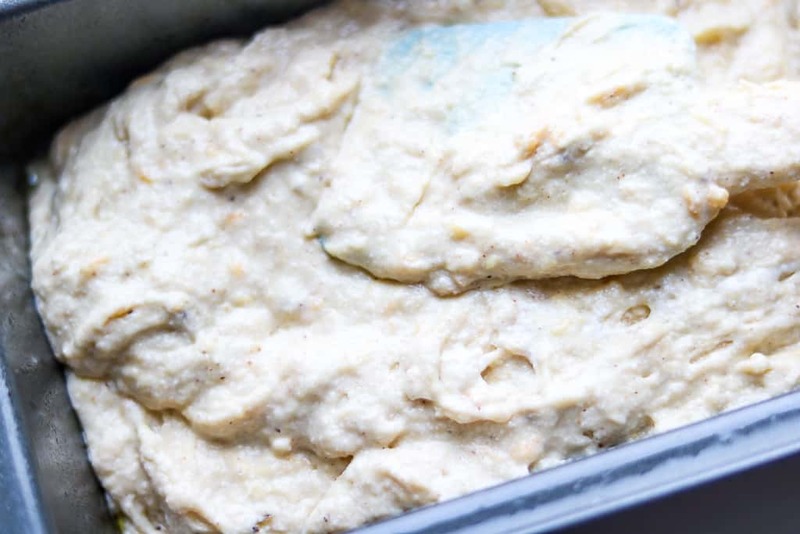 SAVE THIS PLANTAIN BREAD RECIPE TO YOUR PINTEREST BOARDS! 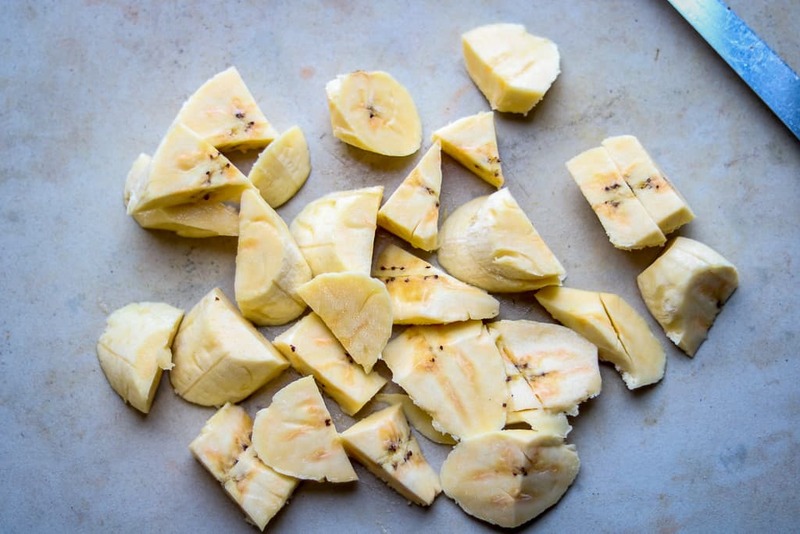 Cut the plantains in small pieces to make it easier to mash. 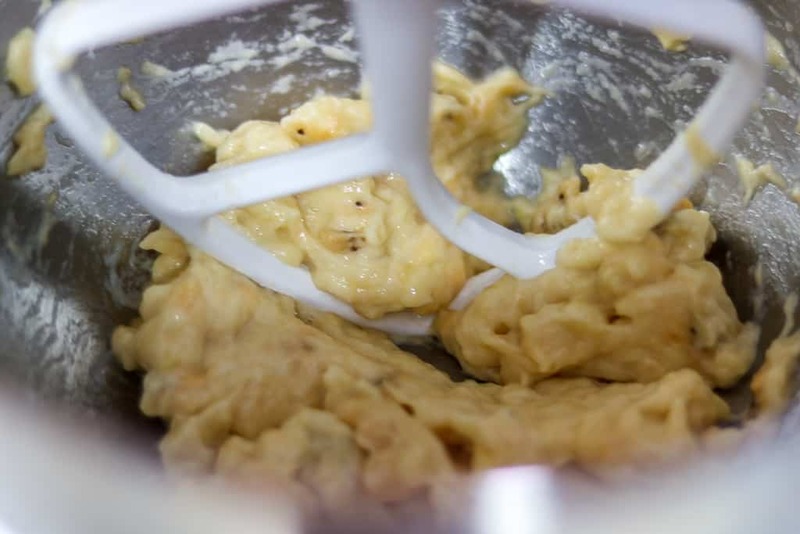 In a kitchen aid mixer or using an electric mixer, mash the plantains. 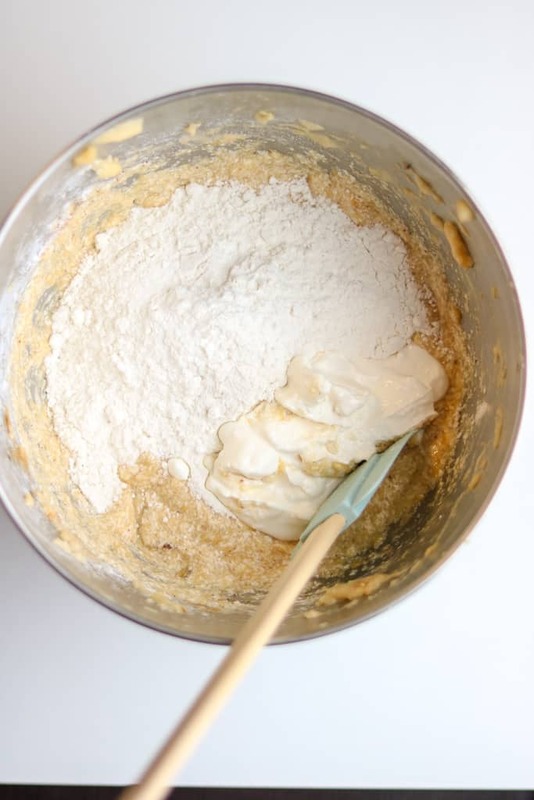 Cream together the butter, eggs, sugar, baking powder, nutmeg, and vanilla extract one at a time. Combine to a smooth consistency. Fold in the flour and sour cream; alternate between each fold. 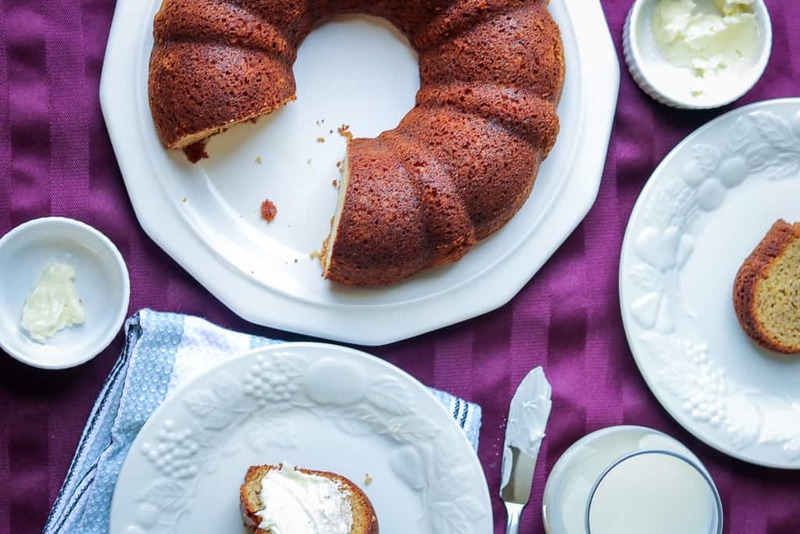 Pour in a greased loaf pan or bundt pan. Bake for 50 minutes or until toothpick comes out clean. Let cool and enjoy for breakfast or with ice cream for dessert. Plantain - the more yellow they are, the sweeter the plantains will be. Flour - I prefer to use the Gluten-free pancake and waffle mix as it is sweet and it also has xanthan gum. I have never worked/cooked with plantain. I do remember enjoying it when I was in St.Lucia. This looks like a great recipe to experiment with. I will look for some next time I grocery shop. Wonderful! I hope you enjoy it! This looks lovely and I can only imagine how great it tastes. Plantains are a little harder to get hold of in the UK but I will give this a try with bananas! Holy Cow!! This looks incredible! 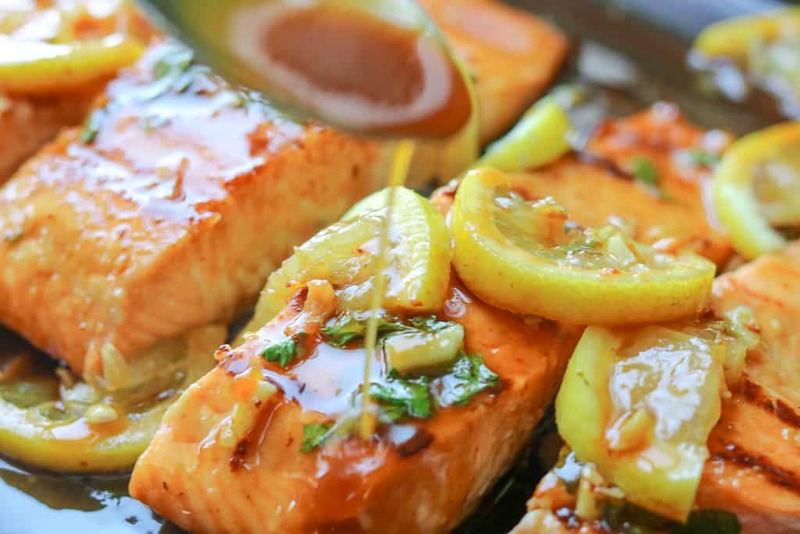 What a stellar recipe packed with so much beauty and flavour. I can’t wait to make this to go with a cup or two of tea. Thanks for another great recipe. This looks amazing! What a fun treat! Thank you for sharing this! I fell in love with plantains only in the last couple years…they are so amazing…ripe OR green!! What a yummy variation! Welcome to the plantain club! I married into a hispanic family and we always have some sort of plantain side dish or snack around! This cake looks incredible! I need to make it for my family, I know they would love it! AWWW thank you, Joni. Please do make it for them. It’s great for breakfast as well. I’ve never baked with plantains before. This cake looks so delicious, though, I might have to try it! I love “platanos”! Platanos is plantains in Spanish. We literally eat them with almost everything in our Puerto Rican meals. Thank so much for this. Now that we have discovered a possible gluten allergy in my son, this is exactly what we need for a holiday snack he can actually have. 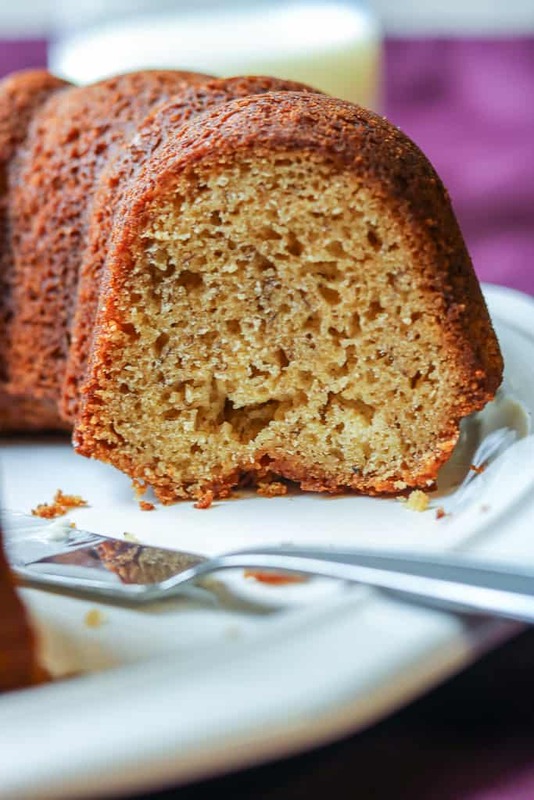 Banana bread is usually a staple bread for us during the holidays, now we can have platanos! That’s sweet, Jeannette. Thank you. We are slowly making a switch to gluten-free as well…slowly. 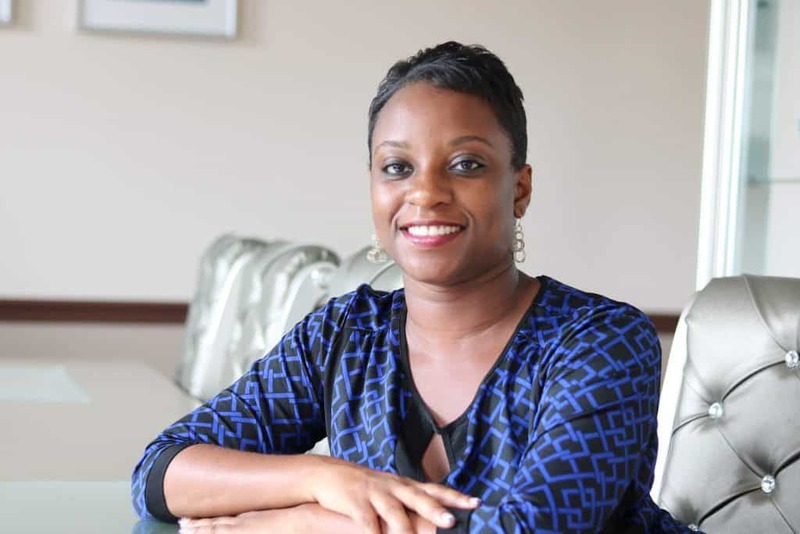 We have to make the switch, as well as our children, have a gluten allergy. Enjoy the holidays! I hope he likes the bread. That bread sounds fabulous! I love that it’s gluten free! I’ve never had plantain bread before but this looks absolutely delicious! I really like banana bread so I’m sure I would love this as well. I have not had plantain cake before, but love plantains in tostones, mofongo, and as chips. I need to wear gloves to peel and slice them or my fingers will turn black. Looks delicious! I don’t like peeling them either. Especially when they are really green. I love mofongo! I need to makes some soon. Never ever baked with plantains before!! I have eaten them, fried like little chips (and loved them) but not in a cake. Sounds wonderful! You are in for a treat! Just make sure the plantains are ripe before baking with them. Thank you, Katie! I love plantains, but have never thought to bake with them before! What a great, and yummy, idea! Wow, this looks so delicious! Especially that picture with butter on top… I’m drooling over here! I’m glad you like it! Thank you, Maddy! I love the idea of using plantains! 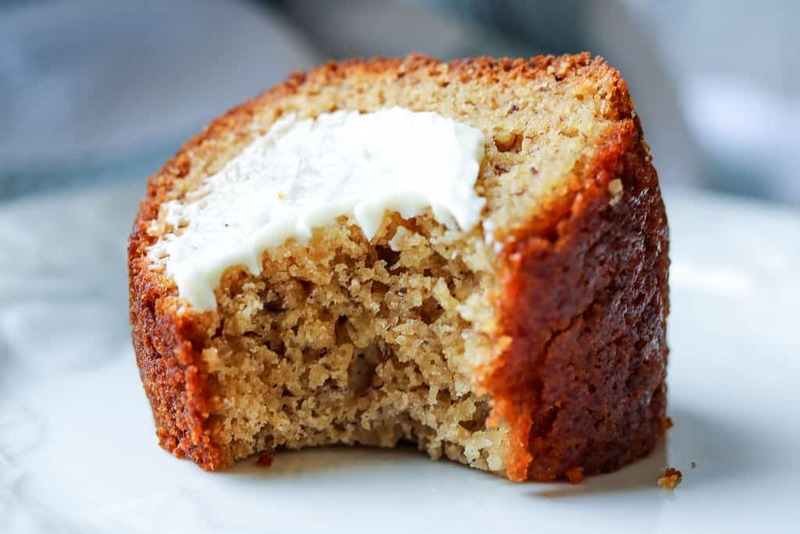 What a fun twist on the typical banana bread and cake. Adding this to my baking list! Thanks for sharing. What a gorgeous and delicious cake. Saving it for later ! I’ve never made banana bread with pancake mix but what a great idea. 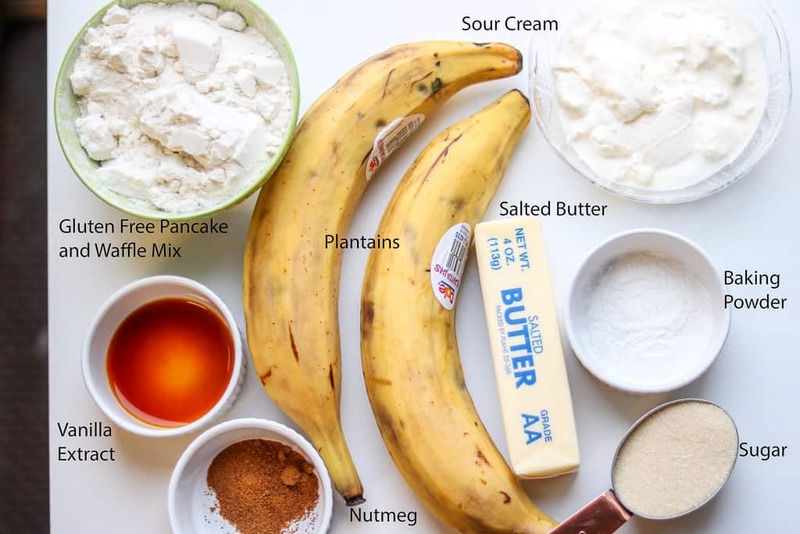 I’m excited to try your version of plantain bread. It’s different but it works! Thanks for reading, Kelly! I think I have had so many banana breads already that it is about time to switch to something healthier and… different! 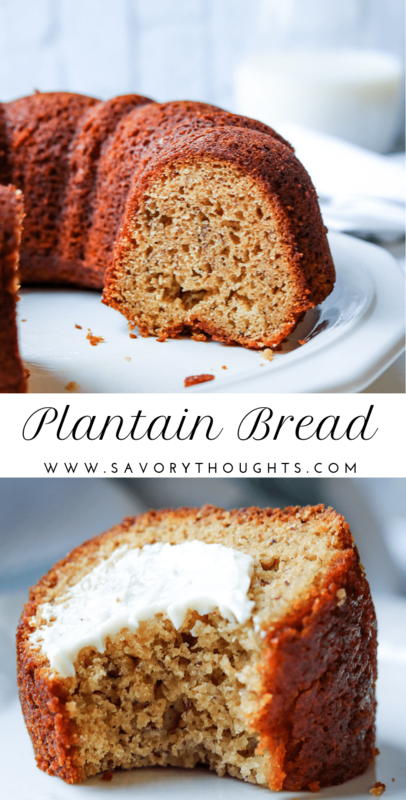 This easy plaintain bread looks so good AND it is gluten-free which is just what I need – thank you! I love banana bread, it’s so comforting. I would love to try using plantains instead, it’s so delicious. Thank you, Mari. It is as comforting, especially with butter on top, YUM! It looks so moist and yummy and I bet makes the house smell delicious while baking! ahhhh! 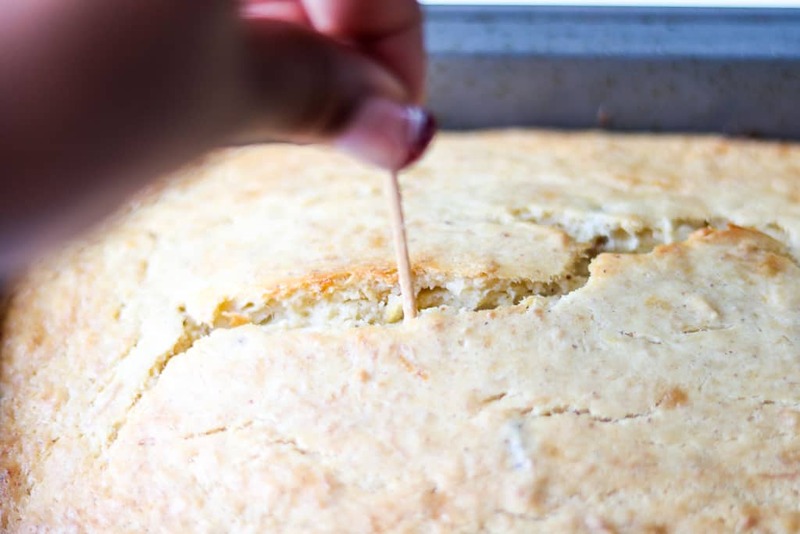 This plantain bread looks and sounds delicious! It’s hard to find plantains here in Italy, but I’d love to try this recipe with banana. it is actually the same concept as banana bread. Enjoy! I’ve never had a plantain but I keep seeing delicious recipes for them that make me want to try them! Including this bread! I have never made plantain bread but always see them at the grocery store! Pinning to make soon! Now you have a reason to pick them up. It’s delicious! Just make sure you get the ripe ones. Yum! I love plantains, but have never had it as a bread. I cannot wait to make this. One quick question, do you know if I can use spelt flour instead of the GF pancake mix? Yes, you can use spelt flour instead of GF flour. Hey, island neighbor! I grew up in the Dominican Republic and eating plantains all the time. I’ve never made a bread with it, though. Definitely gonna try this one! Well, hello neighbor!!! I hope you try it. it’s sweet, soft and it is perfect for breakfast. I love that you used gluten-free pancake mix for this recipe! 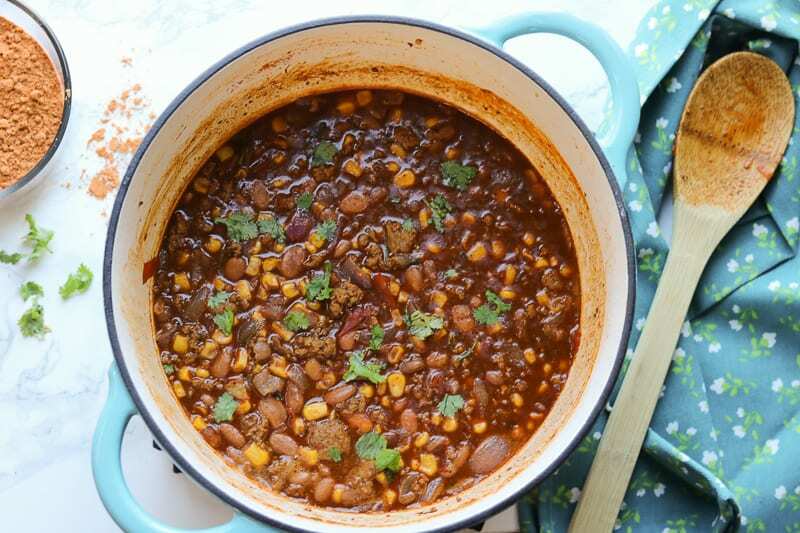 I actually have more than I know what to do with, so I’ll definitely be trying this recipe! It looks great! Good! Now you have an excuse to use the mix. I hope you enjoy it. Thank you! 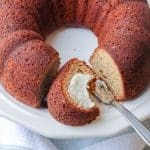 The cake is super moist and soft and the texture looks amazing. I would love to have this with some hot coffee and some books by the side. It is great with coffee. I have never made plantain bread or cake. This looks easy and delicious! Thanks for the recipe. Looks like one to try!! Big and serious! The Jamaican in me wants to hug you, call this “Wicked!” and give you a 21 gun salute. Seriously, MUST try this recipe. Thanks for sharing. Haha! You are funny. Thank you, Kari! Plantains are one of my all time favorite foods in the entire world. 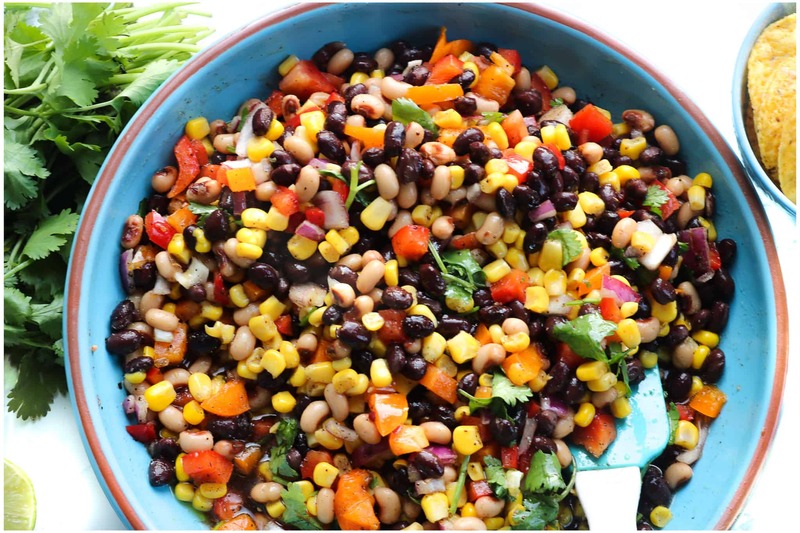 I use them and all their versions in both sweet and savory dishes and this is one I definitely want to try! I love plantains too, Mereille. Thanks for reading! Wow this looks incredibly delicious! I love that it’s GF too so you can be sure to meet your guest’s dietary needs during the holidays! Good and thank you. I hope you enjoy it! I don’t have gf pancake mix can I just use regular pancake mix? You can. However, I would be careful as you do not want the texture to be too runny. You may also use regular flour and add a 1 teaspoon baking soda and 1 teaspoon baking powder. I have no butter in my house! Do you think I can use coconut oil instead?? I have never tried it with coconut oil. However, I have used vegetable oil.